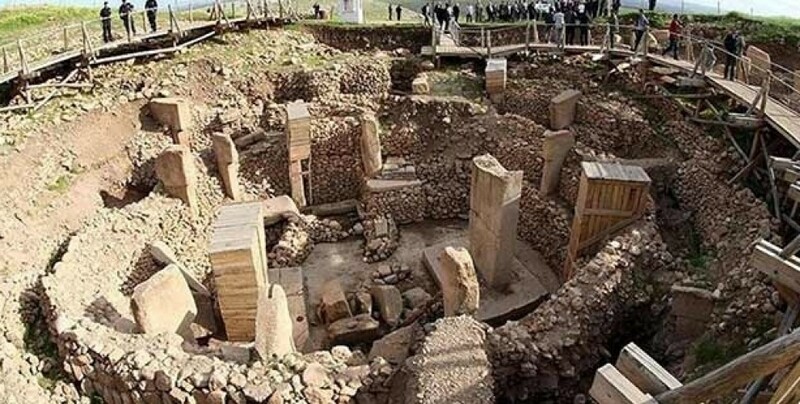 Göbeklitepe (Potbelly Hill) has been inserted by the United Nations Educational, Scientific and Cultural Organization (UNESCO) in the organization's "World Heritage List". At the 42nd World Heritage Committee meeting held in Bahrain, Göbeklitepe has been selected as one of the sites to be inserted in the UNESCO World Heritage List. Göbeklitepe is an archaeological site located at approximately 300 meters from the village of Örencik and 20 kilometers north of Urfa, in North Kurdistan. It dates back to the 10th-12th millennium BC. The hill has a height of 15 m and is about 300 m in diameter. It is approximately 760 m (2,490 ft) above sea level. Archeologists said that the hill includes two phases of use believed to be of a social or ritual nature dating back to the 10th–8th millennium BCE. During the first phase, belonging to the Pre-Pottery Neolithic A, circles of massive T-shaped stone pillars were erected – the world's oldest known megaliths. More than 200 pillars in about 20 circles are currently known through geophysical surveys. In the second phase, belonging to the Pre-Pottery Neolithic B, the erected pillars are smaller and stood in rectangular rooms with floors of polished lime. Archeologists said that the site was abandoned after the Pre-Pottery Neolithic B. Younger structures date to classical times. The details of the structure's function remain a mystery. The site was excavated by a German archaeological team under the direction of Klaus Schmidt from 1996 until his death in 2014. Schmidt believed that the site was a sanctuary where people from a wide region periodically congregated, not a settlement.